A jack-knifed tractor trailer at the Interstate 75 South and Interstate 24 West split is causing major traffic delays Saturday afternoon through Chattanooga. UPDATE at 5 p.m.: The wreck has been cleared. A disabled vehicle is causing slight delays at the split. The tractor trailer crashed off the right side of Interstate 75, causing the right lanes to be blocked. Traffic is crawling and clogged for miles. 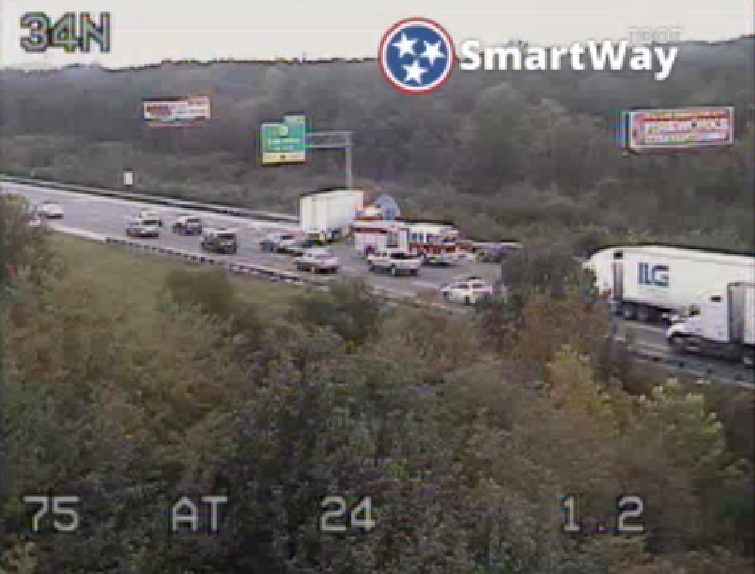 The wreck was reported at 11:40 a.m. and isn't expected to be cleared until at least 3:40 p.m.
A disabled vehicle at mile marker 3 on Interstate 75 South is causing further delays leading into the traffic jam for the jack-knifed tractor trailer.